Join us Saturday, April 20 for a FREE Easter Hunt at Fort Zumwalt East High School! The event is free, but participants are welcome to make donations to our event sponsor, Central County Community Outreach. A generous gift from one locally owned business will help firefighters with Central County Fire & Rescue (CCFR) continue their CCFR Community Outreach efforts, which help residents get back on their feet in the aftermath of fires and other emergencies, and supports other community programs. 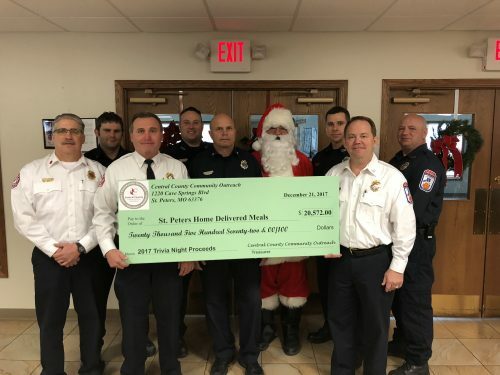 When budget cuts threatened the local home delivered meals program, Central County Fire & Rescue firefighters, St. Peters City officials and the community came together to ensure its safety. Join us Oct. 27 for our 7th annual trivia night! All proceeds will benefit the St. Peters Senior Center Home Delivered Meals program. Tickets are $25 per person or $200 for a table of eight. Complimentary soda and beer will be provided; guests are welcome to bring food and decorations for their table. 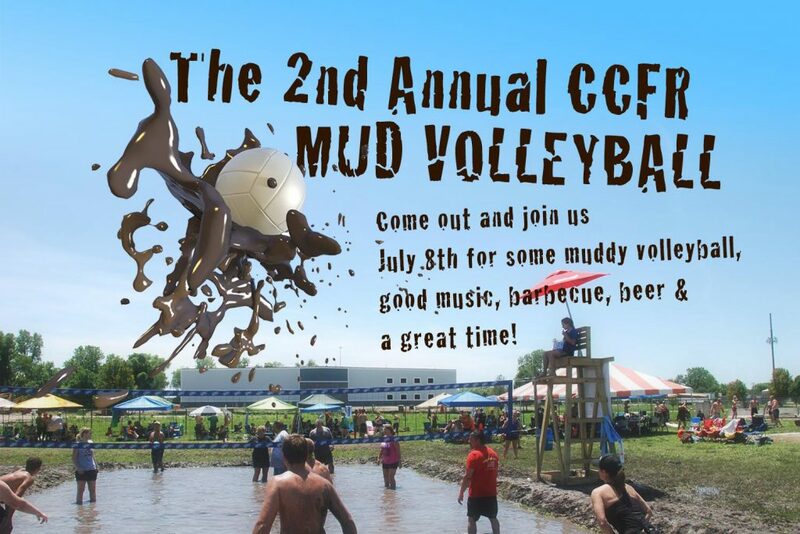 Doors open at 6 p.m., and 10 rounds of trivia will begin at 7 p.m.
On July 8, join CCFR Community Outreach for its second annual Mud Volleyball Tournament. WHAT: A fun fundraiser for the Disabled Athlete Sports Association in St. Peters and the continued efforts of CCFR’s Community Outreach program. Featuring more than 70 teams playing on six courts while enjoying BBQ, beer and specialty drinks — all for a great cause! First and second place teams will win a cash prize. Register a team of six (min. 2 female players per team) for $150; each team will play a guaranteed three games in first round-robin open bracket. Each team will receive six drink tickets — no outside alcohol will be permitted. To celebrate the season of giving, the crews at Central County Fire & Rescue (CCFR) have come together to adopt area families in need. CCFR firefighter Alan Cross, director of the Central County Community Outreach Program, worked with local elementary schools to identify six local families; each family was paired with one of the district’s six stations so that crews could gather gifts and other supplies. 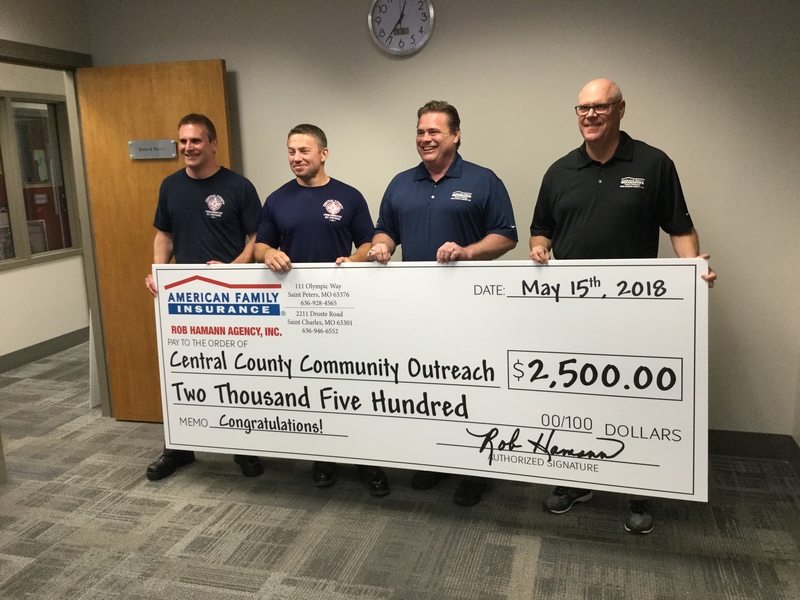 The money being used to assist these families was raised by firefighters at fundraising events throughout the year and provided by the Central County Community Outreach Program. This program was founded by a group of CCFR firefighters who realized that many families needed help after house fires and other emergency situations. This 501(c)3 non-profit program is funded through donations and provides assistance to families in need, conducts community education and outreach efforts and supports local community organizations.The members of the Community Outreach program organize a variety of community events such as regular movie nights at the fire stations, and the Gifts for Kids toy drive. Join Central County Fire & Rescue Community Outreach for its first annual Charity Mud Volleyball Tournament. Enjoy a fun day filled with food trucks, beer, a DJ and more, all for two great causes! All proceeds benefit the Disabled Athletic Sports Association and the CCFR Community Outreach Program. *Each team must have at least six players, and at least two of those players must be female. REGISTRATION FOR THE FALL 2015 SESSION IS NOW OPEN. EMAIL BRIAN BEASLEY OR CALL 636.970.9700X403 OR FOR AN APPLICATION. Classes begin Wednesday, Sept. 9, at 6 p.m., at CCFR Fire Station 3, 511 Willott Rd. This is an eight-week course. When many people think of firefighting they think of a Hollywood movie scene. Firefighters rush into a building where they see a bright room full of flames while they quickly rescue those in danger. Now it’s time to learn what it’s really like. The goal of the Citizen Fire Academy is to provide the community a hands-on understanding of what it takes to be a CCFR firefighter. Participants are given a chance to interact with the firefighters, learn about the fire service, and receive hands-on experience with some of the tasks and tools used to fight fires and save lives. The CCFR Citizen Fire Academy provides community members with the education and experience to safely understand the operations and functions of the fire department. Academy participants attend classroom lecture sessions and practical hands-on events where they experience the inside world of the fire service. The safety of the participants is of the utmost importance and every step is monitored by fire department instructors. Because firefighting is an inherently dangerous job, no participants will be expected to perform any task they do not wish, nor will they participate in any real emergency situations. Email Brian Beasley or call 636.970.9700×403 or for an application. The Citizen Fire Academy meets one evening a week for eight weeks from 6-9 p.m. There is a $25 administration fee to enroll. For the classroom lectures, comfortable clothes are acceptable. For the practical exercises participants should wear work clothing. To obtain your graduation certificate, you must not miss more than two classes. Attendance at all classes is highly encouraged due to the information given. Call 636.970.9700 or email us to apply today.